Rick Stein’s national live tour is happening now. A friend and fellow food enthusiast drew my attention to a competition being hosted by Stein to uncover ‘Ultimate Australian’ dishes. Well didn’t my little ticker start racing with enthusiasm! Then didn’t I find myself awfully perplexed! What’s Australian food? We all puzzled for days. Don’t we just borrow from everyone and everywhere and love it and appreciate it as though it’s our own? Or do we just make it up as we go along? I had spanakopita for breakfast, a Vietnamese pork and salad roll for lunch and I made a hot Singapore curry for dinner. The cornish pasties from a generations old recipe that my Dad’s mum used to cook when I was little made me weak at the knees the moment I entered her house and smelt them baking. Mum’s mum made lamb and barley soup that was so delicate, so perfect. I just can’t make it the same. My mother cooks honey soy chicken wings that make my toes stretch open and Vietnamese spring rolls to die for. My Dad makes the best Canadian breakfast known to planet earth! The specialties of my culinary forebears reflect the truly diverse nature of ‘Australian food’, whatever that term means to you. As for the choice of meat pie… My friends and family might think this an unexpected one from a girl who by the age of three preferred slurpy black bean chicken feet at yum cha to vegemite sandwiches and at 28 would definitely order an assam laksa over a sloppy steak burger with the lot any day! I chose such a humble thing to cook because let’s face it, if there’s one food item you can buy on almost every main street in every village, town or city in Australia it’s a meat pie. If there’s one food countless Aussies (young and old) crave while pounding the pavements of foreign lands it’s a hot steamy meat pie with a generous glob of tomato sauce. If there’s one food most people new to the country are curious to try it’s a meat pie. Admittedly, there are probably more bad pies being sold out there than good ones. 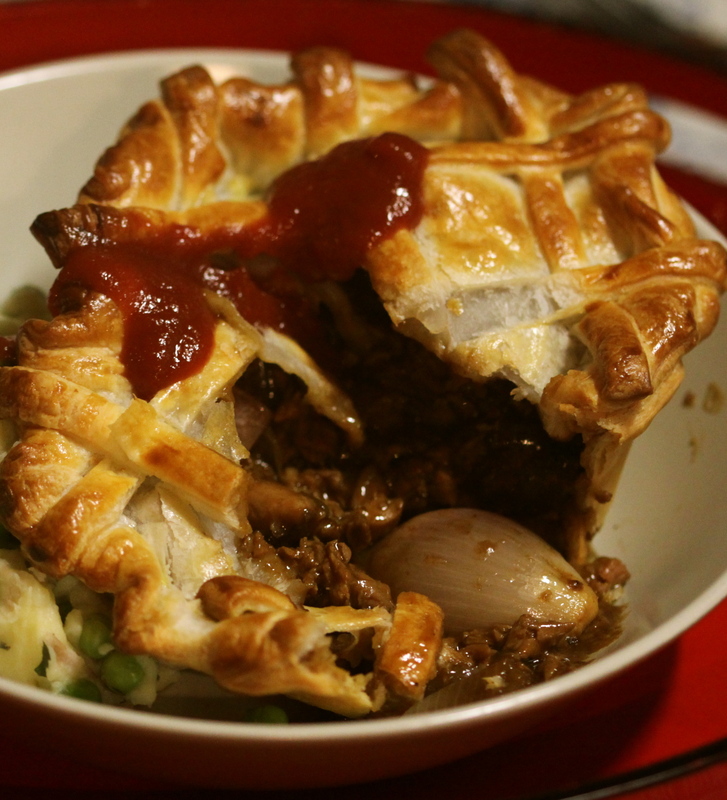 I cannot personally remedy this sad fact but I can cook a real beauty of a pie in my own kitchen, using the most lovely (and cherished) animal *baaaahh* and the one and only fair dinkum, down right favourite drink of Aussies – BEER glorious BEER. I have to say the thing I like most about cooking this dish is pretending I’m not sure which beer to use – a great excuse to stand around taste testing! To salute Mr Stein I’ve chosen an aptly named Australian stout as the feature ingredient of the dish I have created for the competition. ‘Hatlifter Stout’ is what gives this pie its ‘wow’ factor. It’s from Gippsland (VIC) and it is delicious. 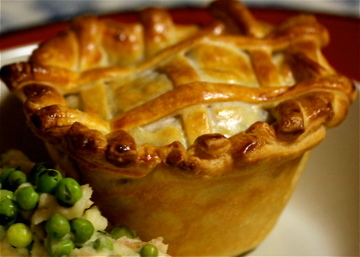 The dark, slightly bitter, sweet and full bodied flavour of the stout adds such a rich depth to the gravy for this pie. The smell of the gravy is irresistible. It’s truly a resistance test to not dive in for a big forkful of the filling before it reaches the pie shells! 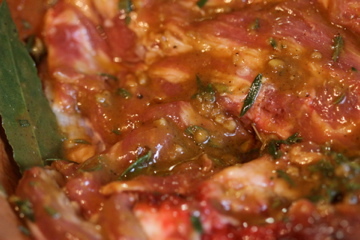 Firstly, combine all of the marinade ingredients in a bowl, smother over the lamb and marinade in the fridge for as long as you have (minimum one hour). Fresh bay leaves and rosemary are must haves! Then, place the meat on a roasting rack in a roasting pan and cook for 2-3 hours (depending on the weight of the shoulder) at 180 degrees. Add the onions to the pan about 30 minutes before the end of cooking. Toss them around in the pan juices. Don’t worry about dark bits, they add flavour intensity to the yummy filling! Alternatively, if you cooked a lamb roast yesterday or the day before – use up all the leftovers. Easy! 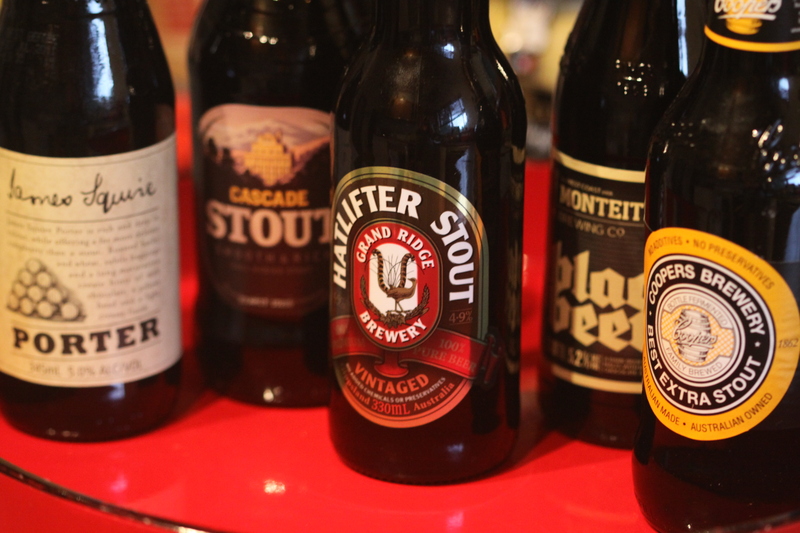 Ok so I snuck in a NZ black beer. I had to taste test for the best (it didn’t win)! I decided to go with the Hatlifter – smooth and robust for a rich gravy. 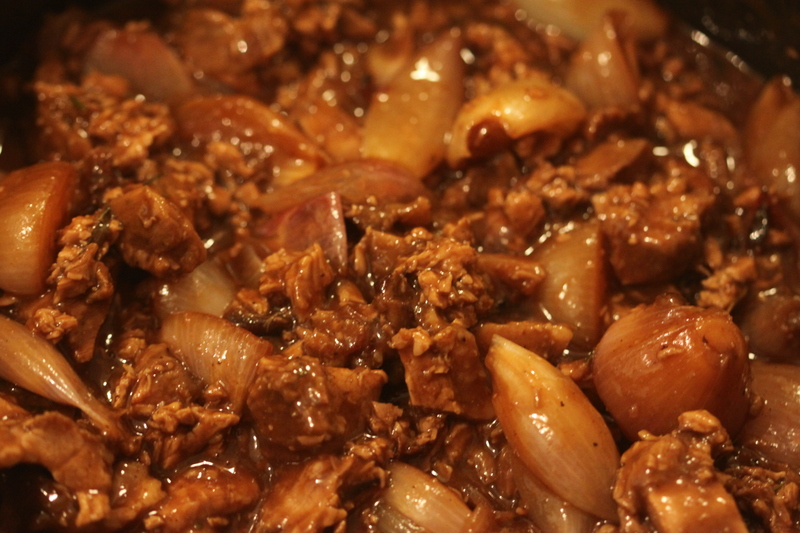 As you would make gravy from pan juices for a roast, simply remove the meat and onions and set them aside. Place the roasting pan on the stove over low heat and stir the flour into the pan juices. Deglaze with the beer first, then add the stock (or water). Stir out and squash any lumps. Add the onions to the gravy and simmer while stirring until thick and smooth. The flavour of the gravy will mellow out as it cools and then as it is re-cooked. If it tastes a little bitter at first, don’t worry this recipe should all balance out in the end. Second last, chop up the meat. I like to have some big chunky bites and the rest quite fine. This makes for a nicely textured filling. Combine the meat and gravy and set aside to cool completely. 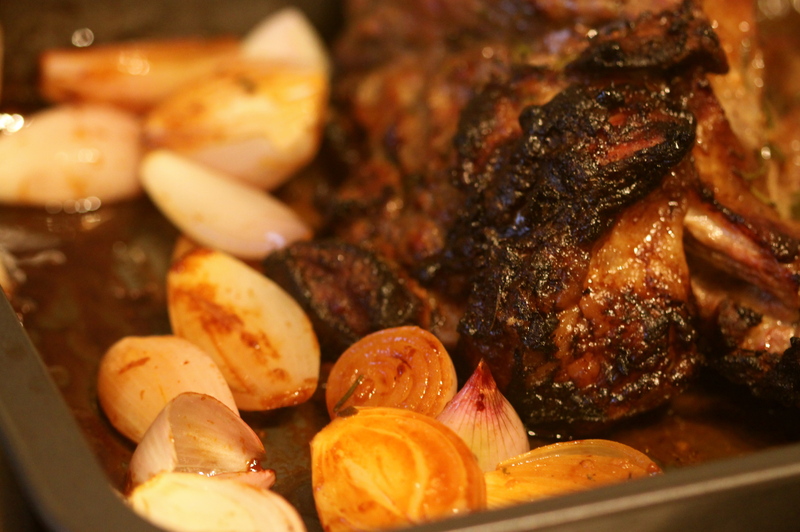 Lamb, beer and onions – the aroma is unbearably good! Finally, make the pies… Use shortcrust for the base and puff for the tops. Spoon the filling into prepared pie cases and top with puff pastry. Brush with a little egg and milk and bake for about 20 minutes in a 200 degree oven. Mr Stein, I hope you get to eat a yummy Aussie meat pie while you’re here! Friends, I hope to see you at the show! I’ll be there with bells on (thanks for the tickets Mum)! Click the link below to check it out. I can’t wait to make this, eat it and wash it down with all the leftover stout!